Back to the Future Nike Sneakers Are Here!!! 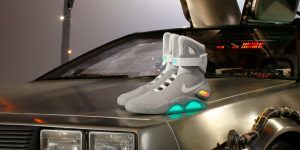 So remember from ‘Back to the Future’ Part 2 where Marty travels to the future and he gets those sweet Nike shoes that auto lace up? Well that is a reality and those exact shoes are being sold now. 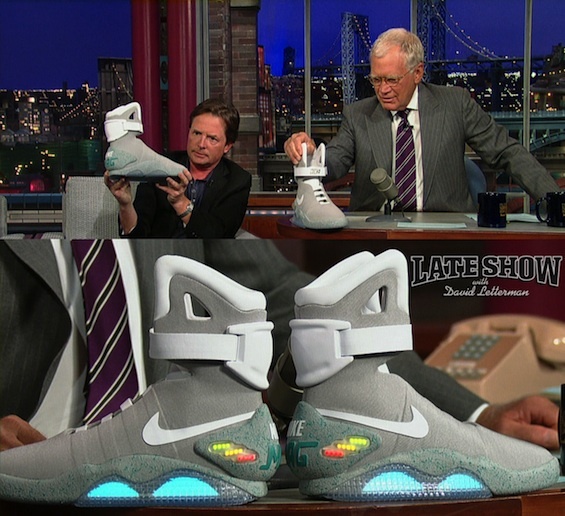 There will be 1500 pairs available and the proceeds will go to fund Michael J. Fox’s Parkinson’s research. So amazing. Below are some screen shots and actual trailers fro the tennis shoe. Enjoy and don’t forget to get a pair. The laces do not auto lace but they do light up. Which is very cool. Here are a couple of trailers for the shoe. And here is a screenshot of Michael J. 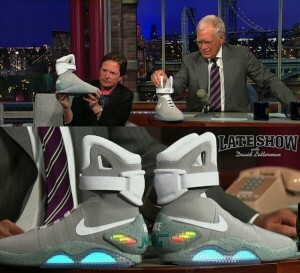 Fox on Letterman talking about the shoe. Also before Nike’s big announcement today, several select members of the press got a box in the mail with a vintage glass bottle of Pepsi, 80’s candy, Back to the Future DVD, Doc Brown’s silver plated glasses, and a message from Doc Brown. So click HERE for the ebay auction. For ten days, 150 pairs of the shoes will be auctioned off. Right now, the shoes are going for several thousand. Best of luck. Cool Stuff: Nike DeLorean Dunk 6.0 Sneaker!! This entry was posted on Thursday, September 8th, 2011 at 11:28 pm	and is filed under News. You can follow any responses to this entry through the RSS 2.0 feed. You can skip to the end and leave a response. Pinging is currently not allowed. « Mel Gibson To Make Jewish Hero Epic on Judah Maccabee!! !